If New England shuts down Green Bay's top receivers, the inexperienced players have to come through. GREEN BAY, Wis. — Davante Adams of the Green Bay Packers can trace his ascent to becoming one of the most productive receivers in the NFL to a cold night in late November four years ago. That game against the New England Patriots is proof of how much a rookie must be prepared at any time to step up, even against the toughest of teams. “Well I mean, I let everybody know as far as my approach to the game ever since I got here was just to be ready at all times,” Adams said this week. It’s a lesson the Packers’ current crop of rookie receivers can draw from when Green Bay faces New England again Sunday night, on the road. 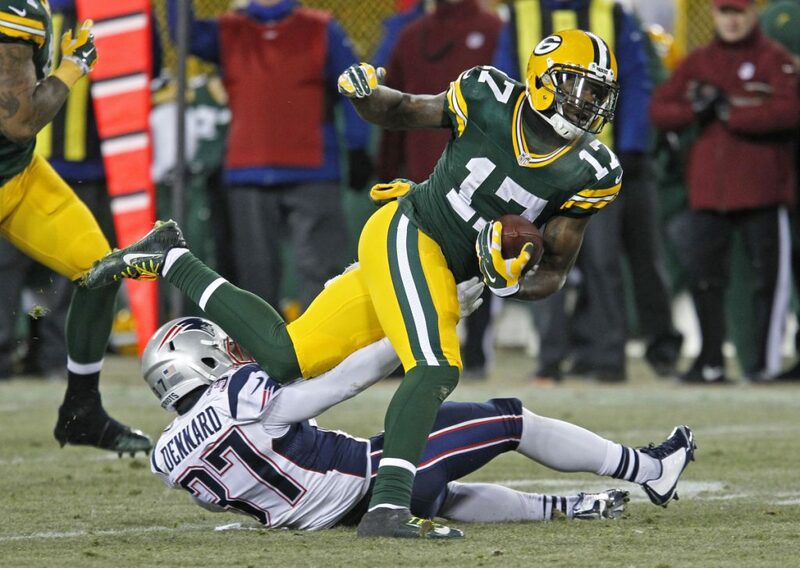 In 2014, Adams took advantage of more looks when the Patriots decided to focus on then-top Packers wideout Jordy Nelson. Adams had six catches for 121 yards on 11 targets, getting as many receptions and targets as he had the three previous games combined. “Yeah, that was probably my coming-out game,” Adams said. Now Adams is quarterback Aaron Rodgers’ top option, the receiver that usually draws an opponent’s best cornerback. Adams has had at least 132 yards receiving in his last three games. “He’s big for us. I think he can do it all from the wide receiver position and we’re expecting a lot of attention by the Patriots’ secondary,” Coach Mike McCarthy said. If that’s the case, it could mean more looks for rookie wideouts Marquez Valdes-Scantling or Equanimeous St. Brown. Valdes-Scantling has especially taken advantage of more work in recent games with injuries to starters Randall Cobb and Geronimo Allison. They returned last week but Valdes-Scantling still caught a touchdown pass, his second in three games. Adams has offered simple, but important advice to the rookies, just like how Nelson did to Adams four years ago. “Don’t try to be (Adams). Don’t try to be Cobb, don’t try to be (Allison). Don’t try to be anybody else that you see,” Valdes-Scantling said in recounting advice from Adams. Valdes-Scantling could draw another start against the Patriots with Allison listed as doubtful after injuring his groin in practice this week to go with an already sore hamstring. Cobb is questionable again with a hamstring injury but seems to be improving. “Be yourself. Everybody does things well, but what you do well, just keep doing it,” Valdes-Scantling added about Adams’ advice. Adams has become an all-around receiver. Explosiveness and an ability to make moves help him gain extra yards after a catch. But while the 26-21 win over the Patriots in 2014 might have been his springboard, it took a while for Adams to gain the kind of consistency that now makes him an important part of the offense. For example, following the Patriots game Adams managed just four catches for 29 yards over his last four regular-season games combined in 2014. Then he had seven catches for 117 yards and a score in a 26-21 win in the playoffs over the Dallas Cowboys. Adams has 28 touchdown catches since the 2016 season. Opposing secondaries have caught on to Adams’ rise, yet he’s still coming up clutch for Rodgers. Linebacker Nick Perry (ankle) and safety Jermaine Whitehead (back) are the only other players on the injury report, listed as questionable for Sunday.